Because my domain controller in the lab rebooted during the Mailbox role install, even when attempting the /RecoverServer switch, it would not work. I ended up nuking the server, rebuild it in AD with the same name, and then reran setup using the /m:recoverserver switch. This is OK in a test environment, but when I tried to reinstall it looked to verify the mailbox databases were in their original path, it failed. I did not have these backed up, but of course in a REAL environment we would have backups of our email databases. You will find the actual server name is not listed at all. When you look at the ExchangeSetupLog, you will find a message that “An Exchange organization with the name <organization> exists” or “Exchange organization cannot be specified” when you perform with the install. This one actually has some good information online already to help in resolving the issue. In short, this has to do because the Manage auditing and security log user right assignment has been set somewhere in GPO – whether it be in a specific GPO or in the Default Domain Policy (which is where I saw it). Once you’ve made this GPO change effecting the Exchange Server, a GPUPDATE /FORCE will not cut it, because this is a computer policy that only gets applied at startup. Reboot the server and restart setup again. This was another fun one that was encountered as part of a cleanup attempt that went wrong. Instead of cleaning up the Default Web Site of virtual directories, etc, the Default Web Site itself was deleted. Thankfully I was able to recreate the site and it automatically assigned it as site #1. In cases where you’re not so lucky, you “may” need to use one of the IIS AdminScripts to change the site ID. There’s an article that goes into more detail on how the process works, using cscript adsutil.vbs. Thankfully on me reference Windows 2012 R2/IIS8 machine it automatically reassigned it. Also with your SSL sites, be sure to select the Microsoft Exchange certificate!!!! This was a particularly nasty one that would reoccur because some old remnant of an install failed and normal methods in detecting/cleaning just didn’t work. This would come up using both the GUI and the command line, with some slightly different wording. And when I searched the registry for this GUID, sure enough I found a left over registry key. Once I delete it and restarted setup, it continued with no problem. In the course of managing Exchange, the situation may arise where you need to uninstall the Exchange organization from your environment. EDIT – Don’t delete the Default Web Site!!!! You might also need to do a search of the registry for keys and values that contain the name MSExchange, Microsoft.Exchange, and Exchange, in the event of getting stuck in a loop reinstalling where it still sees previous components of a failed install. 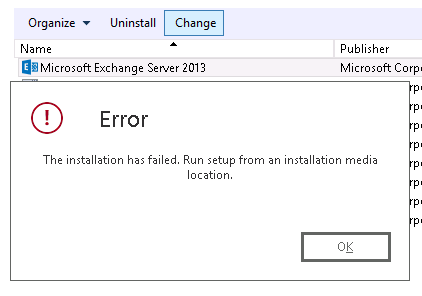 So when I try to uninstall exchange and it indicates there is still a datasbase. I can just remove that entry from ADSIedit for the database and i’ll be able to uninstall it? Ideally, if you can remove Exchange successfully the proper way is to remove user mailboxes, arbitration mailboxes, and then delete the database via EAC. But if all those fail, you CAN use ADSIedit to remove the database to continue the uninstall. You will need to clean up the rest of AD to remove attributes and user accounts, as mentioned above. Thanks for sharing your knowledge and experience. This helped me with a bad install. If that email address works when I get done with all this you know you worked some magic! I have been struggling with Exchange for two days and multiple wipe/re-installs. Thank you so much for posting this. I have handed it off to my other techs as well in case it is ever needed again. Thanks so much for taking the time to post it! There is not a lot of info on Exchange 2013 out there yet so this was very helpful. The install dies right here. Since the install never finished, I can’t remove this via control panel. I’m ready to use the instructions above to remove all this from AD, but I’m worried about the existing Exchange 2007 server that I was going to migrate from. Will removing the items via ADSIEdit as described in this post hurt the current install, or only the exchange 2013 install? Mark, I dropped you an email but wanted to see if Exchange 2007 SP3 CU10 was installed OK for the coexistance for 2013 in an existing 2007 forest. Also, from a topology standpoint deleting the right Exchange 2013 objects would be crucial as to not harm the Exchange organization. I too have a concurrent 2007 with a 2013 that I am trying to remove. I am also concerned with breaking an exchange environment that is working to get 2013 removed. Can you provide the instructions so I do not remove what exchange 2007 needs to operate correctly? Brian – If we were talking Exchange 2003 to 2013 then you would need to do a “swing migration” to either Exchange 2007 or 2010 to get it into 2013. But at the heart of Exchange is Active Directory, and as long as your existing installation is sound, your Exchange 2013 installation will simply join the existing Exchange organization. You’ll need to do the necessary staging and configuration to get 2013 working properly, but once it’s online you should have no problem moving mailboxes, etc. Hi Ines, I wish I could better translate this French but based on what Google Translate was able to help in converting it looks like during the install its having a problem creating the OWA virtual directory on the Default Web Site. I’d need to see the ExchangeServerLogs (which also are probably in French) to determine what specifically it could not do. I’d try there first and also make sure that IIS is healthy – and the Default Web Site exists). I ran into your Website from a google search of desperation. I created a test domain and exchange 2013 on some High end Desktop machines and it worked flawlessly. I got mail flowing thru company firewalls, etc. IT Director loved it,So I bought 4 servers and set out to replicate it on its own production domain. Exchange bombed miserably and now I think I am having issues with AD? This is a brand new domain, and I could start over from Scratch (eek), but, I am desperately looking for the best course of action to get Exchange 2013 loaded. Hi Chip, I dropped you an email to get some more detail on what you’re running in to, would love to help! I had the chance to work with Alfonso and will be posting an update to this blog on some additional things to look at in the troubleshooting arena very soon! SUPER useful article. Thank you so much. I could really do with some advice before I head off to log with Microsoft. I am working at a clients site on an Exchange 2007 to 2013 migration, I believe this is the third migration in a row starting from Exchange 5. Everything looked to be installed properly until I went into EAC and clicked on one of the current Exchange 2007 mailbox servers and got the following error message. I have trawled the internet, checked obvious things like replication and even the object in AD on that domain controller. I think you’re seeing more of an AD-related issue than you are necessarily Exchange itself. Without scouring event logs in both of these places it would be hard to say exactly what the root cause is, but I would most definitely start there. I am migrating SBS2003 to excahnge 2013. But now exchange 2013 installation run into problem because Excahnge 2003 did not uninstalled cleanly. Do you know any good guide how to remove 2003 remains from AD? Exchange 2013 cannot exist in the same forest as Exchange 2003, which is what you are running into here. URGENT !!! Please Help me !!!! I have an Windows Server 2012 R2 Std ran as an AD and DC. “” Unable to grant network access service to the certificate with 581D4C619D6F558D1017286C8B606BA41C93ED67 footprint as a cryptographic exception was thrown. “. My best guess has to do with the actual certificate you’re using with the 581D4C619D6F558D1017286C8B606BA41C93ED67 thumbprint. Sometimes it can be permissions, sometimes it can be the request, and others it can just be that it wasn’t requested or exported to allow the private key use. I’d suggest starting there first. Helpful post there Chris…you jus saved my day. Almost reinstalled my DC. We run into a situation with a 2013 server installed with a 2007 server, (no mboxes on 2013, or mailflow changes),and the 2013 server is starting to throw exceptions (cannot connect to local exchange server etc). Uninstall does not work (mailbox db exists etc), and we do not have a UI to install from cannot connect to the server. ” was run: “Access to the path ‘C:\Program Files\Microsoft\Exchange Server\V15\FrontEnd\HttpProxy\sync\web.config’ is denied.”. Hey Waleed – it’s a rare case but I’ve seen some pretty nasty AD environments (mostly lab have you) that have caused failed Exchange 2013 installs. I’ve spent days upon days in hopes that I can work around it, only to end up blowing away the entire forest. Hopefully you don’t have a production environment in place, as I know that would make it more difficult to achieve.